Yeah I’m going to come straight and tell you that I don’t know how to pronounce either the band or the album title, but I am sure intrigued. Aztec, Mayan, Incan; these are not elements of world culture that appears often in metal, so that when I found Tezcatlipoca’s new record I was definitely interested. ‘Tlayohualtlapelani’ is out now through Iron Bonehead Records. You feel like this record is going to be pretty standard black metal, particularly at the start of opener ‘Notlacahcahualiz Ica Yetztli, Cipactli’, but strange little background elements begin to play a role. Eerie noises weave into between the fiery, cavernous black metal tremolo. The sinister ‘Huey Tlatoani’ is a perfect example of that, conjuring images of darkened rituals done in dark caves. Searing guitar tones wail over blasting rage, while the vocals spout fearsome rasps and growls. The unnerving incantations of ‘Macuil Xochitl Icic’ is just one example of where those ancient cultures lay scorched fingers upon this record, sitting nicely in the middle of a record that continues to burn with a raging passion. The molten fury of ‘Tlacatl Tlein In Mimiqueh Icah Tlahtoa’, the howling ‘Chichimeca, Yaotecatl Ayamictlan’ and particularly the imperious ‘In Tzinacan Itlayohualpatlaniliz’ lay Tezcatlipoca’s claim to be the kings of Mexican black metal, and a mighty claim it is. I’ve never heard anything that sounds like this. 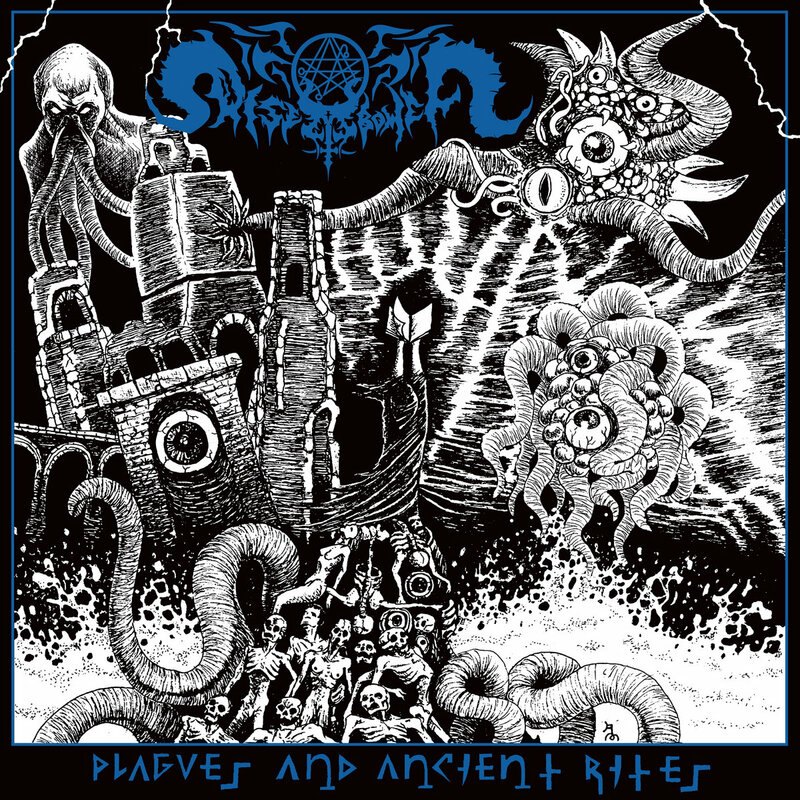 ‘Tlayohualtlpelani’ is a record replete with moments of terrifying black metal, stuff that goes beyond the usual necrotic fetishism. Tezcatlipoca draw deep from ancient and untouched evils, and their take on the genre is fresh, authentic and truly indicative of the fact that this world is full of olden evils we are not aware. Excellent. Australia’s Runespell are dropping their eagerly anticipated debut full length record ‘Unhallowed Blood Oath’ through Iron Bonehead Productions this year, and if you are looking for something that is deeply submerged in 90s black metal classicism then this is likely to be for you. A one man project, Runespell is the work of Nightwolf who also features in Eternum and Blood Stronghold, more profilic members of the fiery Australian black metal world. ‘Oblivion Winds’ builds into a crashing, blastbeat marathon with rasped vocals and murky production values that enhance the mystical connection between music and listener. While violent and abrasive, there is a certain black magic lurking within this slice of vintage black metal. Whether it is the cavernous ‘Heaven in Blood’, the pastoral acoustics of ‘And Wolves Guide Me Home’ or the spellbinding ‘All Thrones Perish’, Runespell really channel the feel of Norwegian black metal circa 1992. When olden rituals are performed, spells cast and black magicks released, albums like ‘Unhallowed Blood Oath’ are the result. A gloriously dark record that pulses with a vintage menace, capturing not only the sound of old school black metal but the FEEL of it too. Runespell feel like a lost legend, resurfacing once more from depths unknown. The majestic ‘White Death’s Wings’ is a centrepiece of an album with no bad tracks. Get it! Brazilian power trio Necromante feed from the same darkness that powered Mystifier, Sarcofago and Impurity, and their debut full length ‘The Magickal Presence of Occult Forces’ comes from a decade of honing their art through demos and live rituals. Iron Bonehead is bringing this one to us, and it is due to drop on the 6th of October this year. The creepy, flute led intro piece is a jarring misdirection for what is to come, which is mainly first wave black metal but with a subtle heavy metal slant to it. ‘Secret Eye’ feels like early Venom, while there’s a gloomy majestic to the rabid ‘Neckrokosmick Pentagram’. Necromante know exactly how to inject a dose of early NWOBHM into their riffing, and it is a delight to hear some of the earworm riffs hiding under a blackened coating. They lack the chaotic savagery of many of their countrymen, but that is not to their detriment. In fact, it feels great to be listening to a band that appreciate the more subtle take on proto black metal. Tracks like ‘Initiation’ and my favourite, ‘A’arab Zaraq’, show how an early take on black metal doesn’t need to be all howling ‘Bathory’ clones. 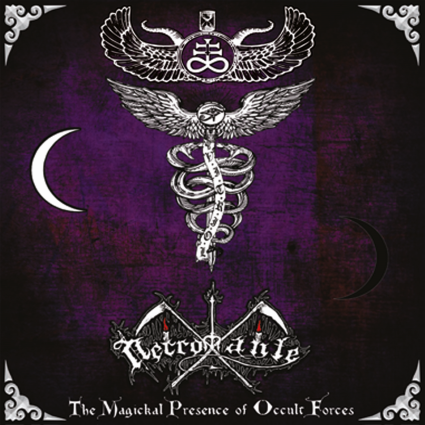 Necromante have absorbed as much Venom and Bathory as they have Angel Witch and Diamond Head, and this blend is a refreshing gem of a record. ‘The Magickal Presence of Occult Forces’ is an absolute joy to listen to, and you should make sure it finds its way into your collection.